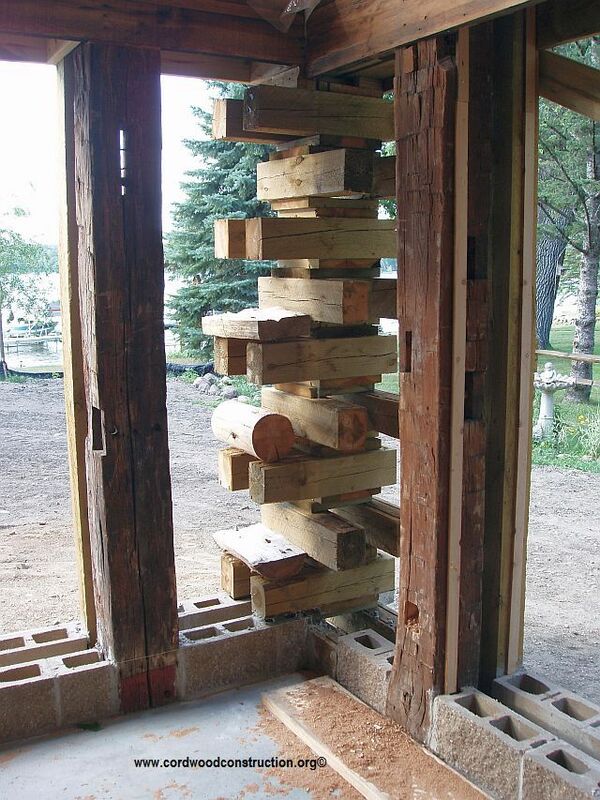 Some cordwood owner/builders want to build Tiny, others opt for Medium, and some want to go Large (or go home :0). 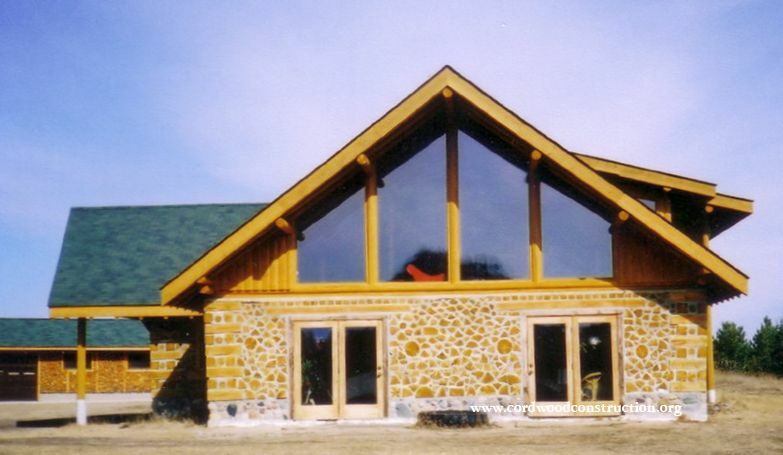 Here is a story about the construction of a gorgeous 4600 square foot cordwood home. Naturally, it took a while and if you read the entire post, the lessons learned are worth the price of admission. Bob and Sheri Gormley bought the family 80-acre farm and after doing research, decided to build a cordwood home. Here is their story: “We both loved the look of horizontal log cabins but had to rethink the project when we received the first cost estimates. Discouraged, but not daunted, we attempted to scale down the plan to make it affordable, but the whole process seemed more like an amputation rather than a solution. 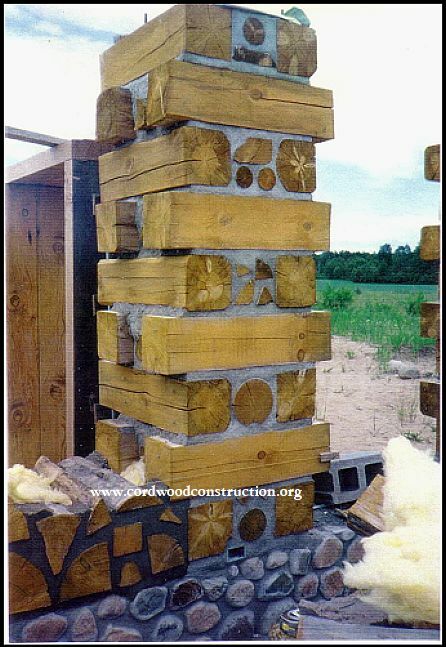 As we wrestled with this new reality, we came across an article on cordwood construction. Sceptical as we were, the idea became more intriguing and we invested in a few books on the subject. 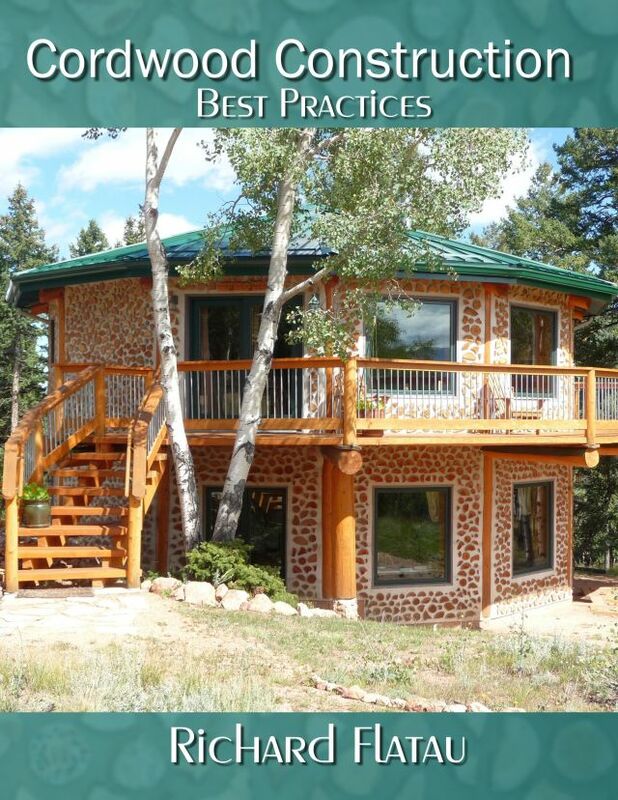 The more research we did, the more we came to believe that building our own cordwood home was achievable. If we weren’t using big logs, we wouldn’t need big equipment. We could handle two-foot logs ourselves and retain the original design if only we could find a reasonable source of logs. Cut-offs from a log home producer proved to be just the ticket. The logs had been debarked and drying for more than three years and the price was right. 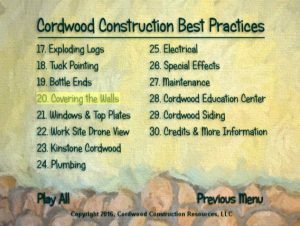 (Actual out-of-pocket expense for the 263 linear feet of 8′ high cordwood wall including wood, mortar and insulation was $2000.) We jumped at the chance to save a bundle by doing the labor ourselves. We bucked the logs to a 24″ length and splitting most of the ones over 4″ in diameter. They were dipped in a borate solution to kill insects and retard mold and mildew. People often stopped wanting to buy firewood and were amazed to find we planned to live in our log pile. We used a Frost Protected Shallow Foundation (FPSF) with pex-tubing for radiant in-floor heat. We made Stackwall corners using 8″ x 8″ x 30″ pine logs. Our mortar mix was a 3 to 1 ratio of sand to masonry cement with a “little Portland for sweetener”. We added one part damp, pine sawdust to the mix. This helps to slow down the set and cure of the mortar, which helps to prevent shrinkage cracks. As Richard Flatau suggests, a child-size swimming pool works well for soaking the sawdust. When the cement had set some, but not entirely, we tuck pointed around each log. We each had a favorite tool for this finishing step. Sheri’s was a butter knife and Bob used a bent spoon handle. Stackwall corner detail. Editors note: It is much easier to build the Stackwall corner as a post first and add a coating of mortar later. It saves many, many hours of labor (see below). (Above) This Stackwall corner was built ahead of time. It was nailed and screwed together so it acts like a post and the building can be roofed. 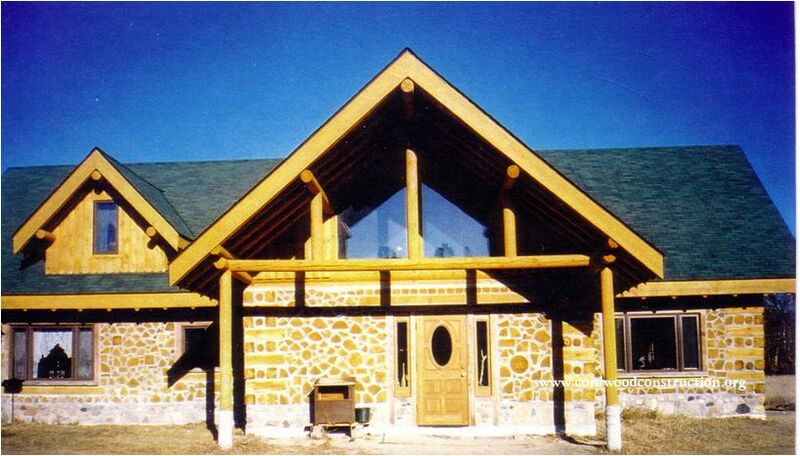 Northwood Log Homes designed, blueprinted and supplied the logs for the roof system. This was the most expensive part of the house. We felt a log rafter and purlin system would be in keeping with the rustic style of the building. The 4″ diameter rafters and 7.5″ purlins are turned logs. We did hit a few snags along the way due to the size of the structure (4600 sq. ft.) Our logs were dry when installed, but they sat out two winters. Even though they were covered with tarps, they absorbed moisture. During the first heating season, the logs shrunk. This left gaps to be filled. We filled the larger gaps using a dual-cell backer rod which is very flexible and compressible. Cracks were then sealed with one of two products; grey Log Builder caulk from Sashco or Standard Gray Chinking from Weatherall (a mortar-textured sealant). We were cautioned repeatedly in all the information we gathered, to limit the size of a cordwood project. Now that we have experience, we recognize the wisdom of this advice. 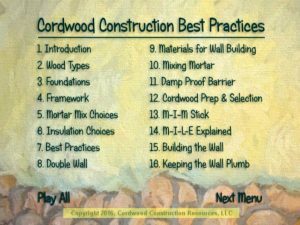 We were able to visit one cordwood home while contemplating this project. The last thing we heard as we headed for the door was “Don’t be afraid to build big.” Of course, that’s what we wanted to hear. All caution flew out the window and our fate was sealed. 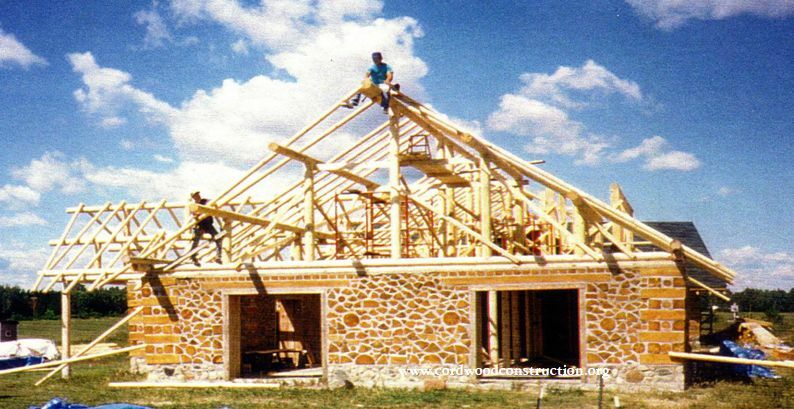 If we were to build again, we would consider post and beam (to get the roof on as soon as possible) and double-wall. With a building method so laden with pitfalls, would we do it again? Absolutely! 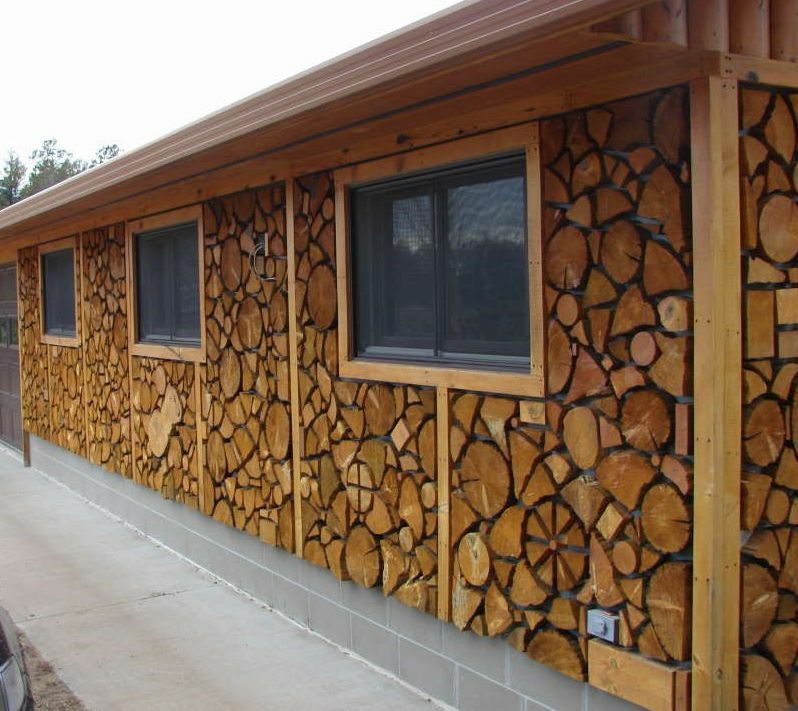 In fact, future plans include cordwood storage buildings using Richard Flatau’s design, a cordwood outhouse and faux cordwood chicken coop and duck house. We would strongly recommend using a plumb bob, string line, level and square to check your walls and especially the corners if using the Stackwall method. Split all logs over 4″ in diameter. Have a dependable cement mixer. Our first one was missing a couple of teeth and would dump a load without warning. You must also be very much in love; with the project and each other. This is not a building process that is easily undertaken by one person. It takes two sets of hands to put up a wall with any degree of efficiency, and two people with the same mindset. Because of all this interest shown by people stopping by while we built, we did not hesitate to open up a small antiques and collectables store on our rural property. A 24′ x 48′ building houses the store as well as a woodworking shop for Bob. It is called, what else The STARWOOD STORE! It was built in 2000-2001 and the interior finished in 2002. 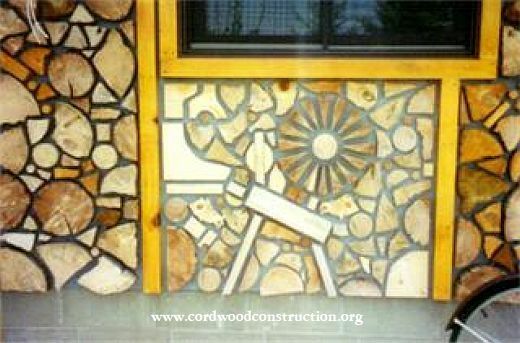 We wanted it to look like cordwood from the outside so as to blend with the house. 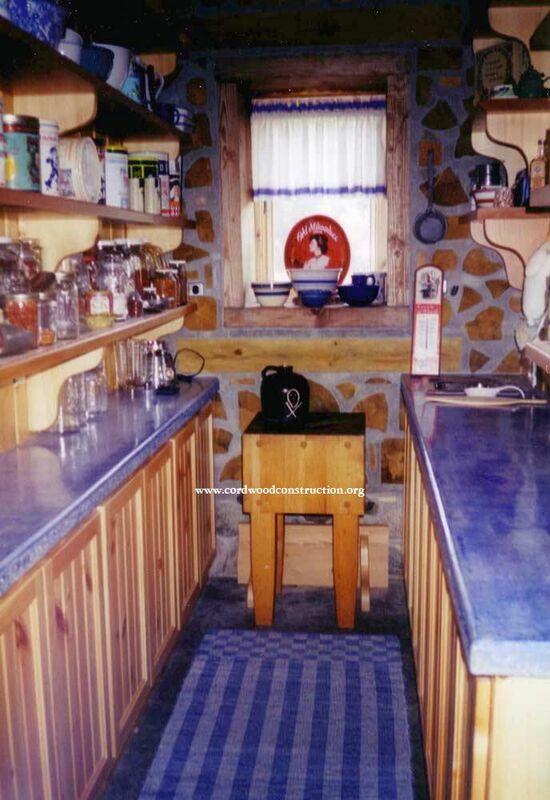 The outside wall was covered with plywood, painted grey to resemble concrete and covered with 2″ thick cordwood pieces; what Richard Flatau calls a “cordwood siding skin”. The pieces are glued, and then screwed to the plywood from the inside. In the future, the exposed grey area will be filled in with a thick mortar. 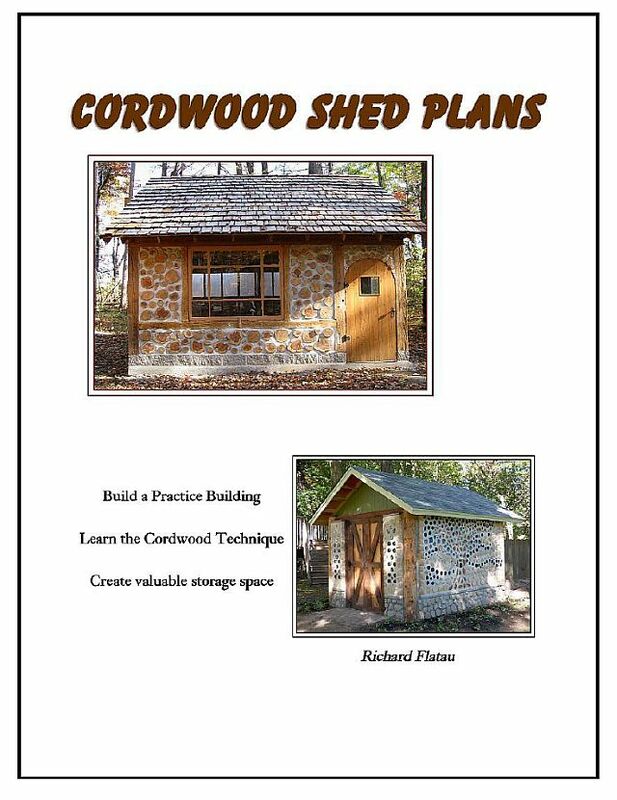 Click on the Cordwood Shed Plans cover to be directed to the ordering site.